The below artworks are the most important by Paolo Veronese - that both overview the major creative periods, and highlight the greatest achievements by the artist. Artwork description & Analysis: Shortly after arriving in Venice, the 25-year-old Veronese accepted a prestigious commission from the Prelate, Bernardo Torlioni, to work on the San Sebastiano ceiling. His painting shows an early point in the biblical story of Esther as she is crowned Queen by the Persian King Ahasuerus. 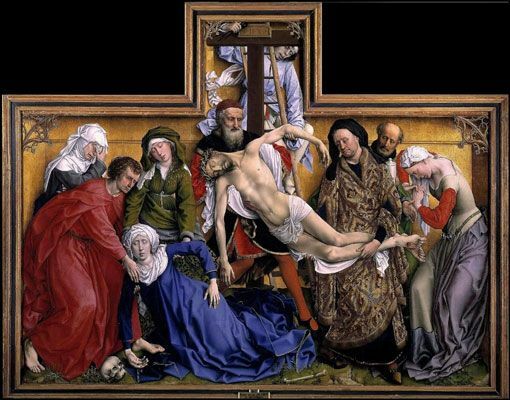 Esther went on to save the Jewish people (from the evil Haman pictured in the lower-right of the painting) and this deliverance from destruction became the Jewish religious celebration of Purim. Artwork description & Analysis: Amongst Veronese's early patrons was the Barbaro family who commissioned him to decorate their villa - the Villa Barbaro - near Maser. 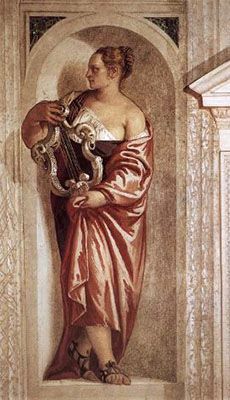 Indeed, Veronese's ability to adapt his work to satisfy his patron's intellectual tastes is well displayed in Muse with Lyre. To complement portraits of the Barbaro family, Veronese painted figures (or Muses) drawn from antiquity. The Muses were typically the Greek goddesses of the arts and sciences and they were often depicted with musical instruments including, but not limited to, the lyre. Art historian Clare Robertson writes that these paintings would utilize a "pictorial language" to breathe "life into abstract personifications" though Veronese's painting displays an unusual level of realism. Despite his more contemporary approach - the Muse is less idealized here - the figure is nevertheless depicted in accordance with classical architectural motifs which helped to solidify the Villa Barbaro's lineage with Classical Greek civilization. As a medium fresco, the work required a very quick execution but Veronese rose to the challenge as evidenced through the Muse's radiant drapery; something of a rarity in a genre that typically appears paler than oil on canvas. At the same time, this work is an excellent example of the terraferma style which combined Venetian coloring with references to antiquity. 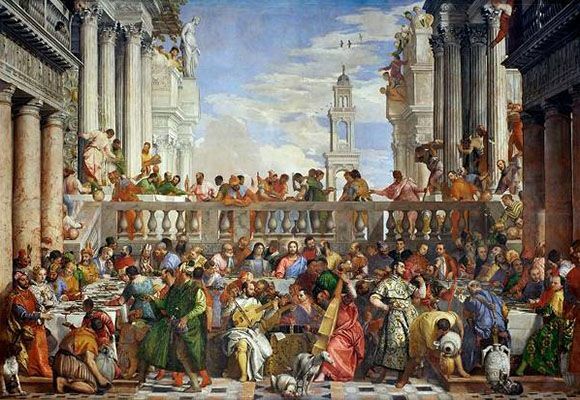 Artwork description & Analysis: The Wedding at Cana was commissioned by the Benedictine monks of San Giorgio Maggiore in Venice to hang in their new refectory designed by Andrea Palladio. The terms of Veronese's commission stipulated that he produce a painting of the wedding feast large enough to fill the entire refectory wall. 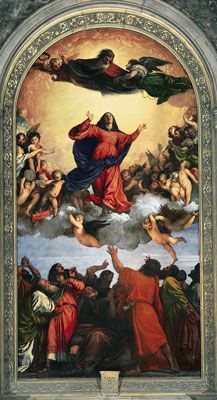 It took Veronese 15 months to complete, probably with the help of his brother, Benedetto Caliari. The masterpiece is based on the Biblical story of Christ's first miracle, though the spectator is asked to work to find that particular parable within the bustle of this multi-layered, modern, painting. As Deanna MacDonald described it: "All this imaginative grandeur swirls around a single miracle. With this image Veronese achieves a delicate balance between worldliness and piety, placing the Son of God amidst the fashionable sophistication of Venetian society." Along with Mary and a few Apostles, Christ was invited to a wedding in Cana in the city of Galilee. During the course of the festivities the supply of wine is exhausted and, responding to Mary's request, Christ asked the servants to fill stone jars with water (here, depicted in the right foreground) and offer them to the master of the house (sitting in the left foreground) who discovers to his amazement (and joy) that the water has been turned to wine. This story is also a precursor to the Eucharist, which is alluded to by the servant sacrificing the "Lamb of God" in the upper tier just above Christ (who sits next to Mary at the centre of the vast banquet table). Veronese freely mixes the biblical with the contemporary. As one would expect, Jesus and Mary are surrounded by luminous auras. They are joined however by no fewer than 130 figures, and while some are clothed in biblical dress, others, in the words of MacDonald again, look "as if they had just walked in from Piazza San Marco." Indeed, featured amongst the "supporting players" - these include servants, jesters, dwarfs and even a parrot and cats and dogs - are Venetian nobles, and distinguished foreigners identified through their exotic dress. Figures including Mary I of England, Suleiman the Magnificent (the tenth Sultan of the Ottoman Empire) and Emperor Charles V are all featured amongst the guests. As MacDonald suggests, "Veronese's lush, vivacious style would at first seem inappropriate for such a pious subject." She points to fact that his preference for luminous color schemes was "designed to delight the eye" while there was always the hint of eroticism in his "supple, sensuous fabrics [that] suggest the body beneath." Veronese's willingness to push these conventions points to a sense of daring that comes through his desire to underscore the sacred with the profane. 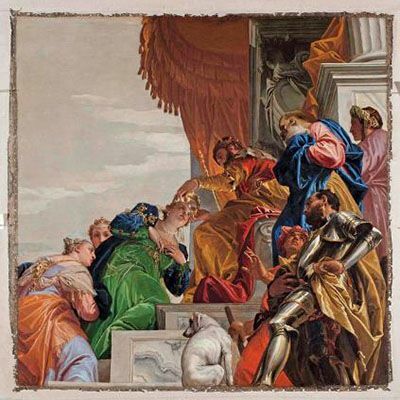 Though the story cannot be verified, it has become part of the painting's legend that the musicians in the centre foreground are none other than Veronese (in white with a viola da gamba). He is flanked by two other Venetian Masters, Titian and Bassano, while the figure examining the wine glass (to his left) is the poet and author, Pietro Aretino. Artwork description & Analysis: Portraits constituted only a small fraction of Veronese's body of work and for that reason they carry their own significance. Here sits Daniele Barbaro, head of an aristocratic family and one of Veronese's major patrons. His clothes infer his high status within local religious institutions and the texts on his desk display his learned nature. Nevertheless, Barbaro sits at an angle historically only reserved for Cardinals and Popes: "such regal pomp and circumstance, such majestic actions, such weight and decorous manner!" 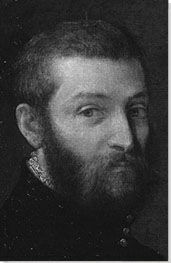 said art historian Marco Boschini of Veronese's portrait. 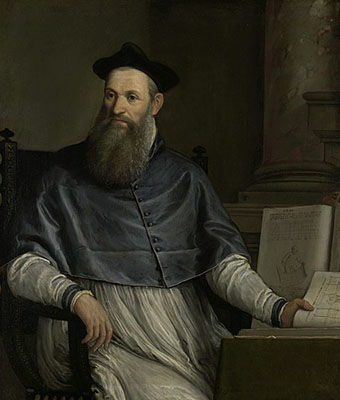 The sitter's posture can be understood then as a projection of professional intent as Barbaro was the Patriarch elect of Aquileia (in a cruel twist of fate, he died in 1570 before taking up his position). The upright book is his work La Practica della Perspettiva (1568) whose meaning is inferred by the painting's different picture planes. The volume in his left hand is his writing on Vitruvius' De Architectura (c.30 BCE), featuring illustrations by Palladio, highlighting the strong links between the three men. The interplay between light and textiles is brightened by the dark background. Titian had painted a portrait of Barbaro and his influence of idealized portraits incorporating psychological insight is seen here. 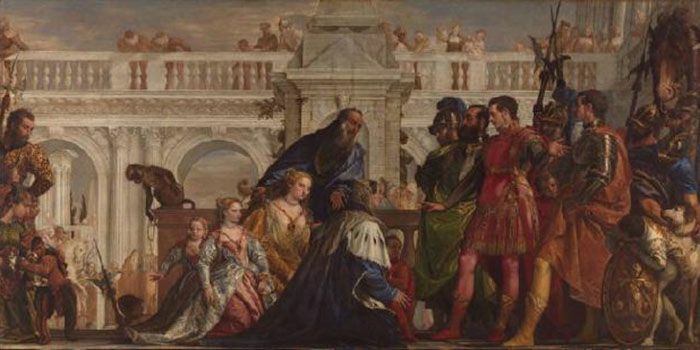 Solomon notes that Veronese's portrait marked a "progress towards a more complex kind of portraiture in which the magnificent costumes and painterly effects were balanced with a deeper psychological representation". Artwork description & Analysis: This historical painting depicts Alexander the Great receiving the family of King Darius III of Persia, having just defeated him in battle. King Darius' mother, Sisygambis, kneeling in the centre of the painting, mistakes Alexander's friend and aide Hephaestion (probably having been taken in by the finery of the counsellor's dress) for the victorious monarch. This potentially grave insult is overlooked by Alexander in a demonstration of benevolence and nobility. Veronese's interpretation of the scene is subtly ambiguous, and the spectator can be forgiven for thinking that Hephaestion is indeed Alexander. However, most of the figures are elegantly dressed in the modern Venetian fashion while the victorious Alexander, who is clad rather in heroic armour, belongs to the origins of classical historical painting. Like so many of Veronese's paintings, the architectural surroundings are constructed to form a tableau with the low horizon helping replicate the experience of watching a popular stage production. Indeed, Veronese has exaggerated the drama of the scene by setting events in the grounds of a palace (rather than in a war tent). He further forgoes any obligation to naturalism by dressing his figures - or "players" - in ostentatious clothing. No less a writer than Johann Wolfgang von Goethe defended the painting's sartorial extravagance when he commented that "Once it is understood that Veronese wanted to paint an episode of the sixteenth century, no one is going to criticize him for the costumes." The fact that Venice was at that time a major center of global trade meant that it imported a wide array of raw materials used in the production of paints. We can say then that the fact that Veronese is regarded as such a supreme colorist can be attributed, in part at least, to his milieu. Artwork description & Analysis: Venus and Mars depicts a scene from Ovid's Metamorphoses (8 AD) in which the Greek God of love and beauty, Venus, seduces the God of War, Mars. Venus is accompanied by two putti - or cupids - serving as guarantors of the tryst. They ensure this by calming Mars' warhorse (with his own sword) and by tying a ribbon of love around Venus' leg. According to myth, moreover, a daughter, Harmonia, resulted from their union. This was one of three mythological love scenes commissioned by Emperor Rudolf II of the Holy Roman Empire. He was seeking to rival a collection by Titian held in Madrid by Rudolf's uncle King Philip II. Scenes depicting the foibles of the gods were very popular at the times (so much so in fact that Veronese returned to this scene with Venus, Mars and Cupid of 1580). The key theme of this painting however is one of harmony through transformation - chastity transformed by love into charity - a theme highly revered by Emperor Rudolf who was known to surround himself with alchemists. Venus's love is a soothing kind of love and it transforms Mars by nullifying his aggression. Indeed, despite his protective armor, Mars is unable to resist Venus's breast milk which is itself a symbol of maternity and prosperity. Art historian Lawrence Gowing has noted in his analysis of Venus and Mars that Veronese had suggested the theme of transformation too in the way he "established the harmony of natural tones in place of the modelling in dark and light that remained the method of academic chiaroscuro." Artwork description & Analysis: In his analysis of Venus and Mars, Gowing suggested that Veronese's "bright outdoor harmonies enlightened and inspired the whole nineteenth century" and that it was Veronese who had laid the very "foundation of modern painting." One might find further evidence for that argument in his most scandalous religious painting, Feast in the House of Levi. Veronese was commissioned in 1573 by the convent of Basilica di Santi Giovanni e Paolo to produce a painting of the Last Supper. It was intended to replace Titian's The Last Supper (1542-4) which had been destroyed in a refectory fire two years earlier. However, the finished work very quickly alerted the suspicions of the Holy Office, which summoned Veronese to defend the principles of artistic liberty. The House of Levi relies on a hierarchical composition fitting for its religious subject matter (recalling in many ways The Wedding at Cana produced some ten years earlier). The middle section in which Christ sits is defined as a sacred space, with the staircases to the sides, and the luminous white table covering, drawing the spectator's eye to him. 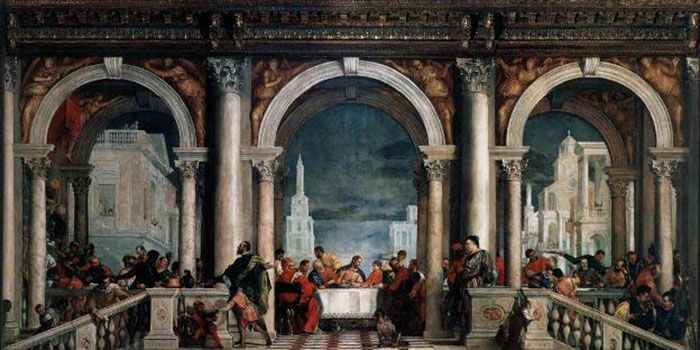 Veronese divides the painting into thirds through the device of the architectural arc, and overall, the composition acts to emphasize Christ's eminence at the very center of the narrative. We can see too a sliding shade of red in the costumes which grow richer the closer we get to Christ: further evidence of Veronese's use of a Venetian palette to manipulate the spectator's eye. Jesus has been invited to attend a banquet with his disciples but he is joined at the feast by tax collectors and other sinners. When questioned about his choice of company, Jesus explains to his followers that he did not seek out the company of the already pious but rather those he considered to be poised for salvation. It was not, of course, this element of the painting that caused offence. 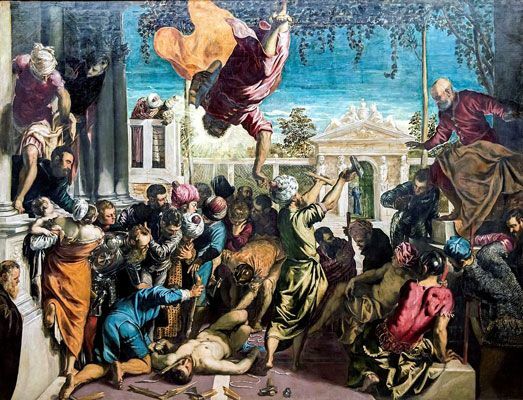 The Holy Office had objected to the painting on grounds of its irreverent details and what was perceived of as Veronese's playful treatment of this most holy of biblical parables. The panel objected to the inclusion of a series of what we might call (given what we have seen previously in works such as The Wedding at Cana) "Veronesian emblems". Indeed Veronese was questioned as to why he had introducing "buffoons, drunken Germans [ergo drunken Protestants], dwarfs, and other such absurdities" (not to mention a dog, a jester holding a parrot and a servant with a nosebleed). Veronese defended their inclusion on grounds of artistic self-expression: "we painters [must be allowed to] take the same liberties as poets and madmen take" he said, while adding that, "when I have some space left over in a picture, I adorn it with figures of my own invention." The tribunal, perhaps influenced by the civil authority, resolved the quarrel by suggesting that a compromise might be reached and the title of the painting be changed for The Last Supper (or a variation there on) to The Feast in the House of Levi.